I was potting up some things yesterday and realized that I was out of my premixed container mix, so I thought I'd post some pictures of how I hand mix it. I mix 8 parts peat to 1 part bark and mix thoroughly. I usually make a lot of this up, because this 'base' doesn't usually change, regardless of what's going to be growing in it. I store this is big trashcans and pull it out as I need it. I just did a big mix, so I didn't need that today. 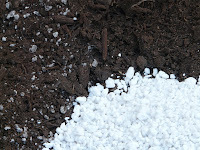 Then, for my general purpose container mix, I mix 4 parts 'base' with 1 part perlite. 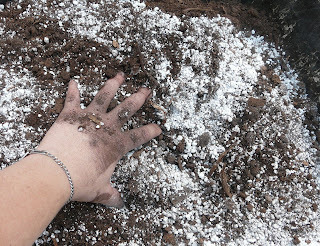 Perlite is a fluffy, volcanic glass and is excellent for opening up mixes and improving drainage. A note to anyone who's mixing peat, sand, or perlite: Please wear a mask! Your lungs will thank you.